At Bison Fleet Specialists, we take pride in our facility’s state of the art equipment. We have every type of vehicle diagnostic equipment available. We have the best computerized truck alignment system manufactured by Hunter Engineering, the Hawkeye Elite. HawkEye Elite is the most powerful wheel alignment equipment on the market today, using four precision cameras to measure the position and orientation of targets mounted to each wheel using Hunter’s patented QuickGrip adaptors. QuickGrip adaptors feature spring-loaded arms that grip the tire, eliminating metal-to-metal contact and subsequent rim damage. 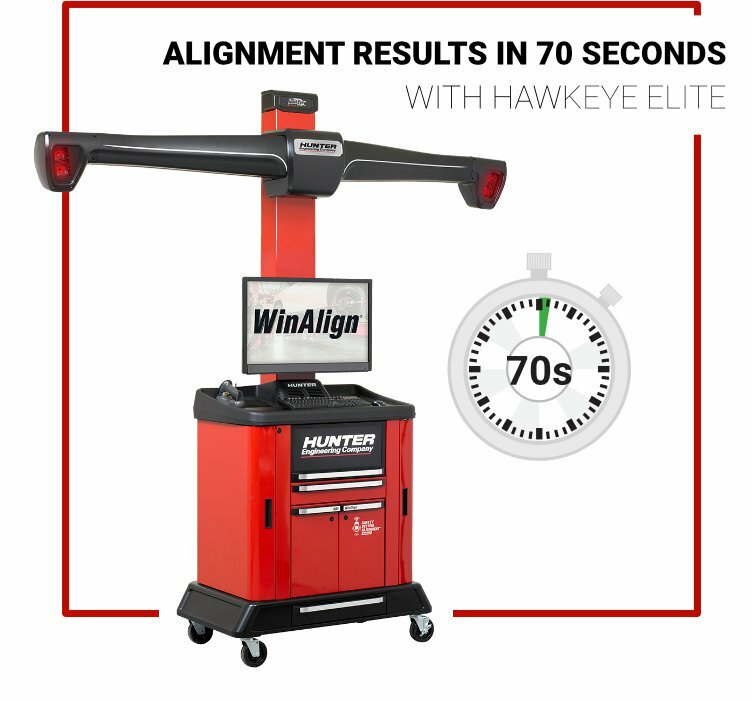 The Hawkeye Elite wheel alignment system can show alignment results in just 70 seconds, returning your fleet vehicle to the road with the fastest turnaround possible. That’s a $40,000 piece of equipment right there. 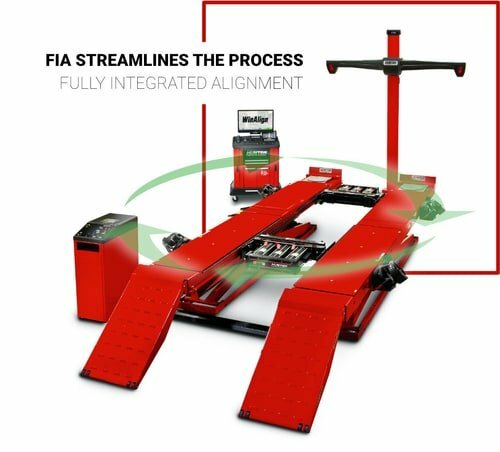 Giving you the fastest, most accurate, & most profitable truck alignment possible. 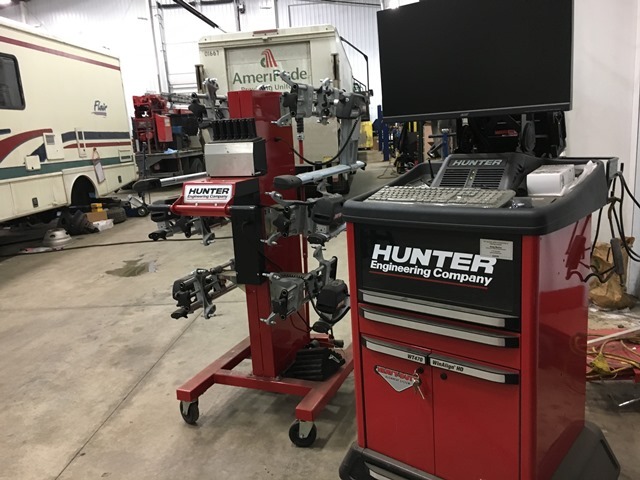 Our Hunter Computerized Alignment System is just one of the many state-of-the-art systems we have on site to service your fleet vehicle. “A properly aligned truck reduces two of a fleet’s highest operating costs: tires and fuel,” according to Nick McCullough. He is president of Rav America, the North American division of Ravaglioli SpA, which was acquired by Downers Grove, Ill.-based Dover Corp. in October 2016. Improved tire wear and better fuel efficiency are the benefits of a properly aligned commercial truck. Yet many operators neglect alignments, according to major tire equipment manufacturers who estimate that up to 70% of commercial vehicles need the service. “It’s always been interesting to me that in the heavy-duty world we’ve got the most expensive tires, the highest number of tires per vehicle, the most weight on those tires, and the tires running the most miles, but alignment has never been in the forefront like it is in automotive,” says Don Glaser, heavy-duty alignment product manager at Hunter Engineering Co.